As President Trump continues to weigh a replacement for former FBI Director James Comey—whom he abruptly fired last week—the lawmakers who oversee the bureau’s authority are growing increasingly concerned that a White House sycophant might top the list. On Monday, Trump said that he was “moving rapidly” to replace Comey, and the Associates Press reported that eight of 14 candidates so far had already been interviewed. The president said Comey’s successor might be named as soon as Friday. Comey was fired on May 9th, and after a dizzying array of often inconsistent justifications from the administration, it came down to this: Trump was continually irritated by the investigation into his campaign’s ties to the Russian government. The initial explanation offered by top Justice Department officials (that Trump was unhappy with Comey’s handling of the Hillary Clinton investigation) has more or less been exposed as a pretext—even by the president himself. “In fact, when I decided to just do it, I said to myself, I said, ‘You know, this Russia thing with Trump and Russia is a made up story, it’s an excuse by the Democrats for having lost an election that they should have won,’” Trump told NBC News on Thursday. Trump’s stunning admission continues to reverberate in Washington, particularly among Democrats—but the concern has now shifted primarily to whether or not Comey will be replaced with Trump ally willing to further derail the FBI probe into Russia’s election hacking. “Naming a politician at a time when public faith in the impartiality of the bureau is in question would be a grave mistake and an insult to the brave men and women of the FBI who are trying to restore that faith,” Senator Ron Wyden, a Democrat on the Senate Intelligence Committee, told Gizmodo on Monday. Trump’s decision to oust Comey was “so inappropriate and raises so many questions about the rule of law in America,” added Wyden, saying that he believes the Senate should not consider confirming any of Trump’s nominees until “at the least” a special counsel is appointed to take over the investigation. “The president’s actions have made a special counsel necessary, and the American public are demanding it,” he said. According to an NBC News/Wall Street Journal poll released Sunday, only 29 percent of Americans approve of Trump’s decision to fire Comey. 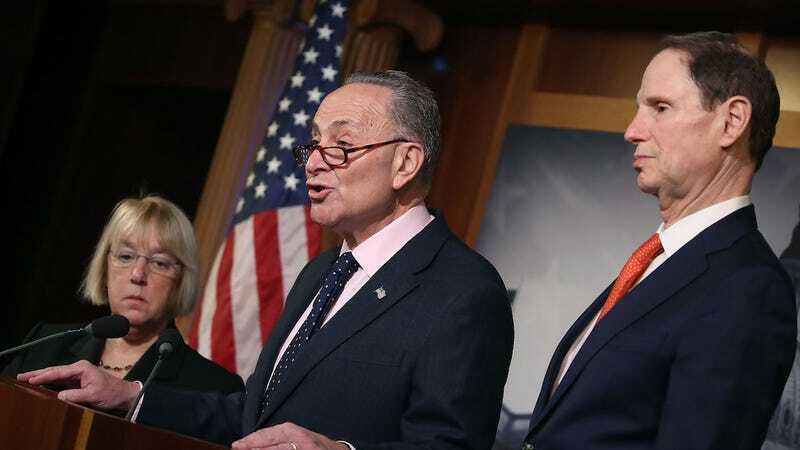 Senate Minority Leader Chuck Schumer informed CNN on Sunday of a growing consensus among Democrats that they should refuse to vote on Trump’s pick unless a special prosecutor is named to assume control of the Russia investigation. “There’s a lot of Democrats who feel that way. We’ll have to discuss this as a caucus, but I would support that move,” he said. A number of Republican politicians are reportedly under consideration for the post, including Senator John Cornyn and Congressman Trey Gowdy, both of whom endorsed Trump’s candidacy last year. The FBI Agents Association, an organization comprised of current and former bureau officials, has endorsed former Congressman Mike Rogers, the former chairman of Senate Intelligence Committee, who is himself a former FBI agent. Others who’ve made the list include: Former NYPD Commissioner Ray Kelly, an ardent defender of stop-and-frisk; Former Deputy Attorney General Larry Thompson, who controversy deported a Canadian citizen to Syria, where he was tortured; and Alice Fisher, a former assistant attorney general, who now now works for a private law firm specializing in white-collar crimes.